Bulk dog waste bags are a great dog waste pick up solution for community dog parks, trails and campgrounds, forest lands, HOAs, and marinas. Our dog park bulk dog waste bags are made with 100% recycled content. They are made from environmentally responsible recycled resin and they let your customers know that you are helping the environment by using green dog waste bags and encouraging dog poop pick-up. They are still strong and thick enough to get the job done so you avoid complaints from customers about bags that are uncomfortable to use or broken. There are no storage or shelf life concerns. This is unlike "biodegradable" dog waste bags that break up into bits of litter during storage. 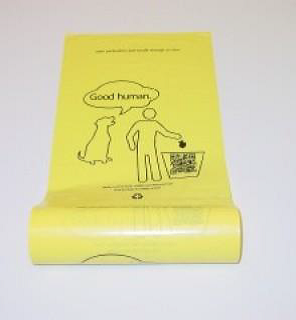 Our wholesale dog poop bags are printed with an outline of a human throwing the dog waste bag in the garbage with the "contributing" dog saying, "good human". Your customer is thanked for doing the right thing with a little bit of humor... encouraging the repeated responsible behavior. 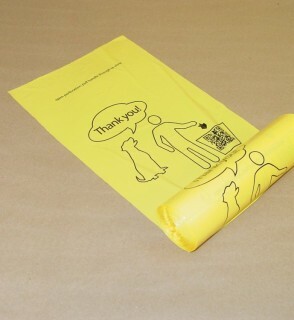 Our bulk dog waste bags are light colored, allowing for easy use in low light. No one wants the user to end up with poop on their hands. They are easily spotted under bushes or along trails, should the user neglect to dispose of properly. We believe the light color provides motivation for proper disposal and helps maintenance workers spot those that haven’t been disposed of properly. These bags also allow for easier spotting when a dispenser needs to be filled. Tying the used dog waste bag closed is easy with our "pull through" tie off the system. You just pull the back handle through the provided opening, slide it down, and it is closed. It even creates a convenient handle for carrying to the garbage can. It's another feature that is not offered with dog mitt style hanging type bags. Both our bulk dog waste bags and roll bag dispensers are proudly made in the USA. We know that for many dog parks and municipalities there is a constant struggle with on-going funding. We realize that budgets are tight. Our bulk dog waste bag is low cost but high quality. Compare our prices to thinner, low quality, imported bags or expensive dog mitt style hanging bags. We have them beat! If you are currently using dog mitt style hanging bags and want the flexibility of less expensive roll waste bags without replacing your current dispensers, we have developed a drop-in converter that requires no dispenser modification. Just drop the converter and the dog mitt dispenser becomes a dual roll bag dispenser. From pet stores to municipalities and more, Classic Plastic's bulk dog poop bags are the cost-effective solution to all your dog waste management needs. Contact Classic Plastic today for more information. Or visit our FAQ page to find the answers to all the most common dog waste bag questions. Dog park roll bag dispenser made from commercial grade powder coated steel.